The Norton Motorcycle Company (formerly Norton Motors, Ltd.) is a British motorcycle marque, originally from Birmingham, England, UK. It was founded in 1898 as a manufacturer of "fittings and parts for the two-wheel trade". By 1902 the company had begun manufacturing motorcycles with bought-in engines. In 1908 a Norton-built engine was added to the range. This began a long series of production of single and eventually twin-cylinder motorcycles, and a long history of racing involvement. Production of the military Model 16 H and Big 4 sidevalve motorcycles was Norton's contribution to the WWII war effort, almost 100,000 being manufactured. When major shareholders started to leave Norton in 1953 the company declined and Associated Motor Cycles bought the shares. Although motorcycle sales went through a recession in the 1950s, and Norton Motors Ltd was only a small manufacturer, Norton sales flourished. A series of Norton Dominator Twins of 500 cc, then 600 cc, then 650 cc and then the 750 cc Norton Atlas kept sales buoyant, especially with sales to the United States. In 1968 the new 750 cc Norton Commando Model appeared, with the engine/gearbox/swingarm unit isolastically insulated from the frame with a series of rubber mountings. This kept the vibrations from the rider, giving a smooth comfortable ride. The Commando was a best seller, and voted #1 Motorcycle of the Year a number of times in Britain. 850 cc models appeared for 1973, giving more torque. For 1975 an electric start arrived in the 850 Mk3. The largest UK motorcycle manufacturer at the time was BSA-Triumph, comprising Birmingham Small Arms Company in Birmingham, and Triumph Motorcycles in Meriden. BSA-Triumph faced difficulties caused by poor management, outdated union practices, old-fashioned motorcycle designs and antiquated factory conditions. A merger with Norton Motorcycles was proposed; but although Dennis Poore's Norton Motorcycles was by far the smaller partner, Poore effectively secured a take-over of BSA-Triumph, forming Norton Villiers Triumph (NVT). The Triumph factory Meriden was the least modern; but workers engaged in a "sit-in", forming a workers' co-operative. Poore was CEO of Manganese Bronze Holdings, a company apparently more concerned with asset stripping than with motorcycle production. Subsequent political manoeuvrings led to the downfall of NVT, as taxpayer-assisted wranglings over amalgamations and sell-offs all but killed the once extensive UK motorcycle industry. In late 2008 Stuart Garner, a UK businessman, bought the rights to Norton from some US concerns and relaunched Norton in its Midlands home at Donington Park where it will develop the 961cc Norton Commando, and a new range of Norton motorcycles. The original company was formed by James Lansdowne Norton (known as "Pa") at 320, Bradford Street, Birmingham, in 1898. In 1902 Norton began building motorcycles with French and Swiss engines. In 1907 a Norton ridden by Rem Fowler won the twin-cylinder class in the first Isle of Man TT race, beginning a sporting tradition that went on until the 1960s. The first Norton engines were made in 1907, with production models available from 1908. These were the 3.5 hp (490 cc) and the 'Big 4' (633cc), beginning a line of side-valve single-cylinder engines which continued with few changes until the late 1950s. The first Norton logo was a fairly simple, art nouveau design, with the name spelled in capitals. However, a new logo appeared on the front of the catalogue for 1914, which was a joint effort by James Norton and his daughter Ethel. It became known as the "curly N" logo, with only the initial letter as a capital, and was used by the company thereafter, first appearing on actual motorcycles in 1915. Ethel Norton also did some testing of her father's motorcycles. On 17 July 1914 O'Donovan also took the flying 5 mile record at 75.88 mph, and the standing start 10 mile record at 73.29 mph, again on the 490 cc Norton. Norton continued production of their 3.5 hp and Big 4 singles well into the war period, though in November 1916 the Ministry of Munitions issued an order that no further work on motor cycles or cars would be allowed from 15 November 1916 without a permit. By this time most motor cycle companies were already either producing munitions (or aircraft parts), or devoted to the export trade. Norton were involved in exporting and earlier that year had announced a new 'Colonial Model' of their 633cc Big 4. This featured an increase in ground clearance from 4.25" to 6.5", by altering the frame, larger tank, greater clearance on mudguards, and a sturdy rear carrier. The engine was unaltered, and transmission was via a Sturmey-Archer 3-speed gearbox. In February 1918 Motor Cycle reported on a visit to Norton Motors. Mr Norton had stated that he expected three post-war models, the 3.5 hp 490 cc TT with belt drive (for the 'speed merchant'), and two utility mounts, one with detuned TT engine, and the other being the Big Four for very heavy solo or sidecar work, both of these with three-speed Sturmey-Archer countershaft gearbox and all chain drive. It was also stated that he had been experimenting with aluminium pistons, and that Norton had produced a book of driving hints which also contained details of their Military and Empire models. In May 1918 Norton stated in one of their adverts that 'The ministry are taking the whole of our present output, but we have a waiting list' - this advert also uses the "Unapproachable Norton" phrase. Few Norton WD models appear in the For Sale column of The Motor Cycle after the war, suggesting they were shipped abroad, apparently one order going to the Russian Army . The 1913-1917 Red Book listing UK Motor, Marine and Aircraft production shows Norton dropped from a full range in 1916, to only the Military Big Four in 1917. Norton resumed deliveries of civilian motorcycles in April 1919 with models aimed at motorcyclists who enjoyed the reliability and performance offered by long-stroke single-cylinder engines with separate gearboxes. Norton also resumed racing and in 1924 the Isle of Man Senior TT was the first win with a race average speed over 60 mph, rider Alec Bennett. Norton won this event ten times until they withdrew from racing in 1938. J.L. Norton died in 1925 aged only 56, but he saw his motorcycles win the Senior and sidecar TTs in 1924, specifically with the 500 cc Model 18, Norton's first overhead valve single. Designed by Walter Moore, the Norton CS1 engine appeared in 1927, based closely on the ES2 pushrod engine and using many of its parts. Moore was hired away to NSU in 1930, after which Arthur Carroll designed an entirely new OHC engine destined to become the basis for all later OHC and DOHC Norton singles. (Moore's move to NSU prompted his former staff to quip NSU stood for "Norton Spares Used") The Norton racing legend began in the 1930s. Of the nine Isle of Man Senior TTs (500 cc) between 1931 and 1939, Norton won seven. Until 1934 Norton bought Sturmey-Archer gearboxes and clutches. When Sturmey discontinued production Norton bought the design rights and had them made by Burman, a manufacturer of proprietary gearboxes. Norton started making military motorcycles again in 1936 after a tender process in 1935 where a modified Norton 16H beat contenders. From 900 in 1936 to 2000 in 1937, Norton was ahead of the competition as war loomed, and there was good reason in terms of spares and maintenance for the military to keep to the same model. Between 1937 and 1945 nearly a quarter (over 100,000) of all British military motorcycles were Nortons, basically the WD 16H (solo) and WD Big Four outfit with driven sidecar wheel. The Isle of Man Senior TT successes continued after the war, with Nortons winning every year from 1947 to 1954. After the Second World War, Norton reverted to civilian motorcycle production, gradually increasing its range. A major addition in 1949 was the twin cylinder Model 7, known as the Norton Dominator, a pushrod 500 cc twin-cylinder machine designed by Bert Hopwood. Its chassis was derived from the ES2 single, with telescopic front and plunger rear suspension, and an updated version of the gearbox known as the "lay-down" box. More shapely mudguards and tanks completed the more modern styling to Nortons new premium model twin. Norton struggled to reclaim its pre-WWII racing dominance as the single-cylinder machine faced fierce competition from the multi-cylinder Italian machines and AJS from the UK. In the 1949 Grand Prix motorcycle racing season, the first year of the world championship, Norton made only fifth place and AJS won. That was before the Featherbed frame appeared, developed for Norton by the McCandless brothers of Belfast in January 1950, used in the legendary Manx Norton and raced by riders including Geoff Duke, John Surtees and Derek Minter. Very quickly the featherbed frame, a design that allowed the construction of a motorcycle with good mass-stiffness distribution, became a benchmark by which all other frames were judged. Norton also experimented with engine placement, and discovered that moving the engine slightly up/down, forward/back, or even right/left, could deliver a "sweet spot" in terms of handling. Motorcycle designers still use this method to fine-tune motorcycle handling. In 1951 the Norton Dominator was made available to export markets as the Model 88 with the Featherbed frame. Later, as production of this frame increased, it became a regular production model, and was made in variants for other models, including the OHV single-cylinder machines. The racing successes were transferred to the street through cafe racers, some of which would use the featherbed frame with an engine from another manufacturer to make a hybrid machine with the best of both worlds. The most famous of these were Tritons - Triumph twin engines in a Norton featherbed frame. Despite, or perhaps because of, the racing successes Norton was in financial difficulty. Reynolds could not make many of the highly desired Featherbed frames and customers lost interest in buying machines with the older frames. In 1953 Norton sold out to Associated Motorcycles (AMC), who owned the brands AJS, Matchless, Francis-Barnett and James. In 1962 the Norton factory in Bracebridge Street, Birmingham was closed and production was moved to AMC's Woolwich factory in south-east London. Under AMC ownership a much improved version of the Norton gearbox was developed, to be used on all the larger models of AJS, Matchless and Norton. Again, the major changes were for improved gear selection. In September 1955 a 600 cc Dominator 99 was launched. 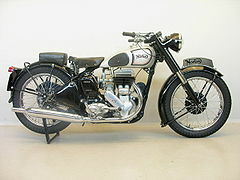 The 1946 to 1953 Long Stroke Manx Norton was 79.6 mm × 100 mm (3.1 in × 3.9 in) initially SOHC, the DOHC engine becoming available to favoured racers in 1949. The Short Stroke model (1953 to 1962) had bore and stroke of 86 mm × 85.6 mm (3.4 in × 3.4 in). It used a dry sump 499 cc single-cylinder motor, with two valves operated by bevel drive, shaft driven twin overhead camshafts. Compression ratio was 11:1. It had an Amal GP carburettor, and a Lucas racing magneto. The 1962 500 cc Manx Nortons produced 50 bhp (37 kW) at 6,780rpm, weighed 142 kg (313 lb), and had a top speed of 209 km/h (130 mph). In 1960, a new version of the road-going Featherbed frame was developed in which the upper frame rails were bent inwards to reduce the width between the rider's knees for greater comfort. The move was also to accommodate the shorter rider as the wide frame made it difficult to reach the ground. This frame is known as the "slimline" frame; the earlier frames then became known as the "wideline". The last Manx Nortons were sold in 1963. Even though Norton had pulled out of Grand Prix racing in 1954, the race-shop at Bracebridge Street continued until 1962, and the Manx became a mainstay of privateer racing, and even today are highly sought after, commanding high prices. On November 7, 1960 the first new 650 cc Norton Manxman was launched for the American market only. By September 1961 the Norton 650SS appeared for the UK market, the 750 cc (Atlas). By April 20, 1962 for the American market as they demanded more power,[clarification needed] but the increases to the vertical twin engine's capacity caused a vibration problem at 5500 rpm. A 500 cc vertical twin is smoother than a single-cylinder, but if the vertical twin's capacity is enlarged vibration increases. The 750 Norton Atlas proved too expensive and costs could not be reduced. Financial problems gathered. There was an export bike primarily for use as a desert racer, sold up until 1969 as the Norton P11, AJS Model 33, Matchless G15 and Norton N15 which used the Norton Atlas engine in a modified Matchless G85CS scrambler frame with Norton wheels and front forks. This bike was reputed to vibrate less than the Featherbed frame model. AMC singles were also sold with Norton badging in this era. Also during this period Norton developed a family of three similar smaller-capacity twin cylinder machines: first the Norton Jubilee 250 and then the Navigator 350 and the Electra 400, which had an electric starter. These models were Norton's first use of unit construction. The engine was an entirely new design by Bert Hopwood and the frame and running gear were from the Francis-Barnett range, also owned by AMC. These machines had a reputation for poor reliability. By the late 1960s, competition from Japanese manufacturers and a rapidly declining home market had driven the whole British motorcycle industry into decline. In 1966 AMC became insolvent and was reformed as Norton-Villiers, part of Manganese Bronze Holdings Ltd. The 750 Norton Atlas was noted for its vibration. Rather than change engines Norton decided to change the frame, and the isolastic-framed Norton Commando 750 was the result. In 1967 the Commando prototype was shown at the Earls Court Show in November, and introduced as a production model for 1968. Its styling, innovative isolastic frame and powerful engine made it an appealing package. The Commando easily outperformed contemporary Triumph and BSA twins and was the most powerful and best-handling British motorcycle of its day. The isolastic frame made it much smoother than the Atlas. It used rubber bushings to isolate the engine and swing arm from the frame, forks, and rider. However, as the steel-shims incorporated in the Isolastic bearings wore, often from rusting, the bike became prone to poor handling – fishtailing in high-speed turns. The "Combat" engine was released in January 1972 with a twin roller bearing crank, 10:1 compression and developing 65 bhp (48 kW) at 6,500 rpm. Reliability immediately suffered, with frequent and early crank-shaft main-bearing failures, sometimes leading to broken crankshafts. Older engines had used one ball-bearing main bearing and one roller bearing main bearing but the Combat engine featured two roller bearings in a mistaken belief this would strengthen the bottom-end to cope with the higher power-output. Instead the resultant crank-bending caused the rollers to "dig-in" to the races, causing rapid failure. This fragility was particularly obvious when measured against the reliability of contemporary Japanese machines. This problem was solved by specifying a heavier duty type of roller bearing, of 'superblend' fame, later in the 1972 production year. The Commando was offered in several different styles: the standard street model, a pseudo-scrambler with upswept pipes and the Interstate, packaged as a tourer. Electric start was introduced on the Mark III in 1974. Sales were respectable but the company declined financially and became insolvent in 1975. In 1976 a Norton with a US-flag theme on the tank could be purchased for US$1,976. In 1972 BSA was also in financial trouble. It was given UK Government help on the condition that it merged with Norton-Villiers, and in 1973 the new Norton Villiers Triumph (NVT) was formed. The Triumph Motorcycles name came from BSA's Triumph subsidiary. In April 1973 an 8.5:1 compression 828 cc "850" engine was released with German FAG SuperBlend bearings. These, featuring slightly barrel-shaped rollers, had been introduced on late model 750 cc engines to cure the Combat engine's problems of crank-flex and the consequent digging-in to the bearing-surface of the initial cylindrical bearing rollers. This model produced 51 bhp (38 kW) at 6,250 rpm but the stated power does not give a true picture of the engine performance because increased torque seemed to make up for the reduced horsepower. In 1974 the UK's outgoing Conservative government withdrew subsidies, but the incoming Labour government restored them after the General Election. Rationalisation of the factory sites to Wolverhampton and Birmingham (BSA's Small Heath site) caused industrial disputes at Triumph's Coventry site; Triumph would go on as a workers cooperative alone. Despite mounting losses, 1974 saw the release of the 828 Roadster, Mark 2 Hi Rider, JPN Replica (John Player Norton) and Mark 2a Interstate. In 1975 the range was down to just two models: the Mark 3 Interstate and the Roadster, but then the UK Government asked for a repayment of its loan and refused export credits, further damaging the company's ability to sell abroad. Production of the two models still made was ended and supplies dwindled. In the 1980s, the company went through several incarnations – mainly because the name was popular and now owned by several parties. In liquidation from NVT the global rights were split between (at least) Norton UK, Germany, America and Rest of the World. MidWest acquired the rights for light aviation use and at Staverton Airport the MidWest AE series was an aero engine developed from the twin-rotor engine. The brand was relaunched on an ambitious scale in Shenstone near Lichfield in 1988. The new models succeeded in racing – winning the Senior TT in 1992 – but they moved rather more slowly in the commercial market. 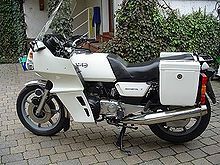 The company had some success making the Wankel-engined Interpol 2 motorcycle for civilian and military police forces and the RAC. This led to a civilian model in 1987 called the Classic. Subsequent Norton Wankels were water-cooled. The Commander was launched in 1988 and was followed by the Spondon-framed F1. This model was a de-tuned replica of Norton's RCW588 factory racing machines which won many short distance races, but had many reliability issues requiring frequent servicing i.e. changing the primary drive chain every 100 miles. 1988 saw a new team brought in to replace Brian Crighton's team, to try to improve the model and reduce some of its reliability issues. The team, headed by ex Honda-team manager Barry Symmons, Honda engineer Chris Mehew and chassis specialist Ron Williams, were tasked with producing a chassis that could be produced cheaply and an engine which would have a long term reliability. The chassis, designed by Ron Williams and made by Harris Products, was based on Yamaha's Delta box stamped panels. However, in spite of many innovative solutions from Chris Mehew, the team's efforts to improve the reliability of the engine could not succeed to a commercially saleable level. The team quickly realized that placing an engine generating 1100 °C exhaust temperatures was not the item to place under a petrol tank. The team's project - renamed the NRS 588 - did win the 1992 Isle of Man TT, ridden by Steve Hislop, as well as North West 200 and Ulster Grand Prix races ridden by Robert Dunlop. Whilst in Northern Ireland, the team met Professor Gordon Blair, one of the foremost automotive engineers from Queen's University Belfast. Prof Blair commented that the Japanese had abandoned development of the motorcycle variant of the Wankel engine on two main counts: 1. As the team had realised, there was just too much heat to be confined in a motorcycle chassis. 2. The pollution created by the engine burning both oil for lubrication and fuel for power was just too great to meet the impending pollution regulations without a large and expensive exhaust scrubbing system. In his TV Series on British industry, Sir John Harvey-Jones commented that the company was governed more by heart than head and the Racing team were the only ones worth saving. The F1 was succeeded by the restyled and slightly less expensive F1 Sport. Chief Executive Phillippe LeRoux attempted to diversify the company to a group with interests in property and leisure, meanwhile supply of Norton Classic was being delayed by supply problems with petrol tanks and headlight shells. At this point the UK Department of Trade and Industry started to investigate improprieties in the investments of financier Philippe LeRoux and his associates following which LeRoux resigned his position as Chief Executive. In a move to manage an outstanding debt of ₤7 million, in 1991 David MacDonald was appointed Chief Executive at the behest of the Midland Bank. McDonald sold the company to the Canadian company Wildrose Ventures in 1993 for around half a million pounds. Head of Wildrose Ventures, Nelson Skalbania, reformed the company as Norton Motors (1993) Ltd., putting his daughter Rosanda in place as General Manager at the Shenstone site. The new ownership attempted to reclaim from public exhibition premises and place for auction with Sothebys ten historic motorcycles, estimated at the time to be worth £50,000, including a 1904 Triumph first exhibited in 1938, which had been variously distributed to National Motor Museum, Beaulieu, Science Museum, London and Coventry Transport Museum. This proved controversial as the museums had assumed the loans had been made on a permanent basis, and former Chief Executive David MacDonald stated "Without doubt anything which existed before 1984 does not belong to the present company. The assets were simply not transferred"
By 1996 the service side of the Shenstone site was closed and transferred to a small factory at Rugeley, Staffordshire. The focus of manufacture was moved to the manufacture of components for light aircraft engines based on the rotary design. It was reported in 2005 that a group of former Norton employees built nine F1 Sport models from existing stocks of parts. During the late 1990s, Kenny Dreer of Oregon evolved from restoring and upgrading Commandos to producing whole machines. He modernised the design and in the early 2000s went into series production with the 961 Commando, but then suspended operations in April 2006. After fifteen years of US ownership the Norton brand was secured by Stuart Garner, UK businessman and owner of Norton Racing Ltd. Garner established a new 15,000 sq ft (1,400 m2) Norton factory at Donington Park to develop the Dreer-based machine. The new Norton is a 961 cc (88 mm × 79 mm (3.5 in × 3.1 in)), air- and oil-cooled pushrod parallel twin with a gear-driven counterbalancer and a 270° crank (a concept pioneered on the Yamaha TRX850). The machine, a single-seat roadster styled after the earlier Commando models, has a claimed rear-wheel power output of 80 hp (60 kW), giving a top speed of over 130 mph (210 km/h). The new operation at Donington Park began limited production of a motorcycle based on the Kenny Dreer 961 Commando. The new motorcycle only shared the outline of the Dreer bike; all aspects of the motorcycle were re-designed in order to move into production. An updated and revised version of the rotary machine first produced in the 1980s is also being developed. The company logo was altered by "doing away with the double crossing of the 't'", in use since 1924, thereby "honouring the very first configuration of the identity, designed by [James] Norton and his daughter." In January 2011 it was announced designer Pierre Terblanche had departed Piaggio/Moto Guzzi to join Norton. In August 2011 UK minister Vince Cable announced that the Government was underwriting a £7.5 million bank loan to Norton, to promote secure cash flow for their export sales. Garner responded that this finance would allow Norton to double annual production from 500 to 1,000 machines. Norton acquired Donington Hall in Castle Donington, North West Leicestershire as its new corporate headquarters in March 2013. This office and engineering facility is situated behind Donington Hall in a modern building complex, known as Hastings House. The Donington Hall site includes 26 country acres surrounded by parkland and ancient deer park. Norton Motorcycles purchased Donington Hall from British Airways for an undisclosed sum, and will vacate the current Norton factory at Donington Park, which has about 40 employees. Shifting operations from Donington Park will be carried out in phases so as to not interfere with either production or distribution of Norton's bikes. ^ a b Holliday, Bob, Norton Story, Patrick Stephens, 1972, p.11. ^ a b c "Norton Motorcycle History". Archived from the original on 24 February 2015. Retrieved 29 January 2016. ^ "Norton History". Retrieved 27 May 2009. ^ See e.g. Holliday, Norton Story, p.17. ^ Woollett, Mick, Norton The Complete Illustrated History, Osprey, 1992, pp. 43, 48. ^ Chadwick, Ian. "Norton". Retrieved 20 December 2008. ^ Smith, Robert (May – June 2011). "1936 Norton Model 18 vs. 1938 Velocette MSS". Motorcycle Classics. Retrieved 18 May 2011. ^ a b c "Motorcycle: Norton CS1". Retrieved 20 December 2008. ^ Best-Motorcycle-Gear.com Archived 29 April 2012 at WebCite, Norton Motorcycle History, Retrieved 23 October 2006. ^ Realclassic.co.uk,Norton P11A on Display, Retrieved 25 October 2006. ^ Ianchadwick.com, Retrieved 23 October 2006. ^ Realclassic.co.uk, Dominator 99 Build, Retrieved 23 October 2006. ^ NTNOA, Combat Questions & Comments, Retrieved 23 October 2006. ^ Hotten, Russell (11 August 1992). "DTI probe into Norton looks at Rudd links (CORRECTED) - Business, News". London: The Independent. Retrieved 12 July 2009. ^ Perkins, Kris (1991). Norton Rotaries. Osprey Publishing. ISBN 978-1-85532-181-6. ^ Woollett, Mick (2004). Norton: The Complete Illustrated History. MotorBooks International. ISBN 978-0-7603-1984-0. ^ MacKinnon, Ian (17 March 1994). "Motorcycle sale causes dismay among the fans: Fears that historic models could disappear from view raised as new Norton owners tell museums to return machines for auction - UK, News". London: The Independent. Retrieved 1 July 2009. ^ Faith, Nicholas (17 July 1994). "Bunhill: Company in need of repair - Business, News". London: The Independent. Retrieved 12 July 2009. ^ "Norton Comes Home!!!". 16 October 2008. Retrieved 4 November 2008. ^ Sinclair, Mark (8 November 2010). "A new, old logo for Norton motorcycles". Creative Review. Archived from the original on 3 November 2017. Retrieved 3 November 2017. ^ "Pierre Terblanche joins Norton". Hell for Leather. ^ The Wire (16 March 2013). "Historic Donington Hall to serve as Norton Motorcycles New World Headquarters and Manufacturing Facilities". Cycle World. Bonnier Corp. Retrieved 17 April 2013. Where else in the world can one tour an 18th century Gothic Revival mansion, view a Norton Motorcycle being built, watch a World Superbike race and attend an Iron Maiden concert all in the same place? ^ Johnson, Robin (16 March 2013). "Motorcycles move into former airline's home over at Donington Hall". Derby Telegraph. Trinity Mirror. Retrieved 17 April 2013. ^ Astley, Oliver (10 April 2013). "Design company revved up for the job to transform home of Norton". Derby Telegraph. Trinity Mirror. Retrieved 17 April 2013. An 18th-century grade two-listed building presents a unique set of challenges, while the more modern Hastings House will provide a fantastic base for both motorcycle design and production. Wikimedia Commons has media related to Norton motorcycles.